In a previous blog, Your Own Personal Fiscal Cliff, I showed that retirement planning is about finding the maximum standard of living you can enjoy during your working years that you can maintain after retiring. That is the green “smoothed-consumption” line from the graph in my previous post that I will reproduce here. 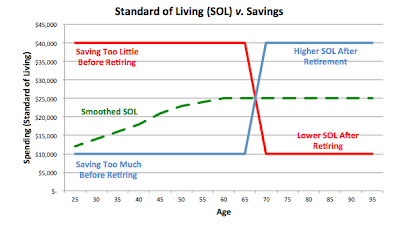 I’ll remove the blue “over-saved” line from this chart to avoid the visual clutter, since I don't think over-saving for retirement is exactly epidemic or that it soon will be. I'm defining standard of living as the amount of discretionary spending you can have at a given age. Sometimes I refer to that as your “spending”, or “expenses” or “consumption”, but I mean basically the same thing — how much money you have to spend as you please. Ideally, we'd like to find the highest (green) line that doesn't move up or down substantially after we retire like the red and blue lines above do. 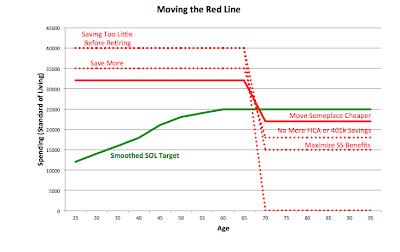 So, how do we move the rightmost portion of the red line up after we retire? There are several ways. Some move the right half of the red line up by moving the left half down (decreasing our pre-retirement standard of living), but a few don't. Same goes for amounts you saved for retirement, into your 401(k) for example, on the left side. That ends when you retire. Maybe your taxes will be lower, maybe not. There may be other expenses that go away and that money can now increase your standard of living after retirement. 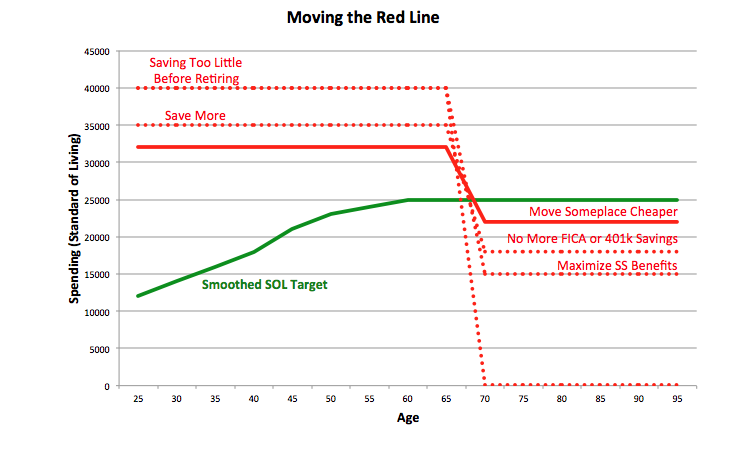 Social Security benefits and pensions move the right half of the red line upward. The problem with Social Security benefits, though, is that they replace at most 30% of you pre-retirement income. For most households, that will still leave quite a gap to fill. Delaying your Social Security retirement benefits will increase them about 8% a year. If you can afford to do that, it's the best insurance against a long, expensive retirement. You may be able to move the right half of the line upward for a while with part-time employment. Be aware, though, that your Social Security benefits will be impacted if you claim before full retirement age (66 for most people nowadays). 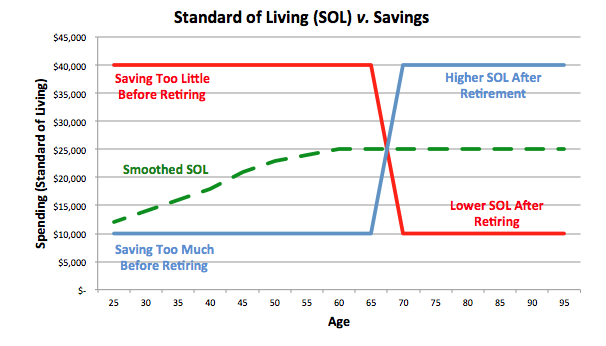 The obvious way to move the red line on the right upward is to increase your retirement savings while you're working, but that also lowers the red line on the left — you're saving more so you spend less. Yet another way to nudge the line upward on the right is to cut your discretionary spending after you retire. Your pre-retirement standard of living might be cheaper somewhere else. And you don't have to move to Ecuador. Property taxes in my hometown of Chapel Hill, NC are far higher than those in Orange County just a couple of miles away, for example. Of course, if you can't generate enough income after you retire, you will have no choice but to cut expenses and reduce your standard of living. Since Social Security benefits constitute 90% or more of retirement income for many families, that’s going to happen a lot. Paying off your mortgage might increase your standard of living in retirement, though I would be concerned that you might be tying up a lot of your savings in a way that's difficult to undo. It's harder than you might think to convert home equity into cash after you retire. Banks, for instance, want to see a steady income before they loan money against your home and most retirees don’t have that. 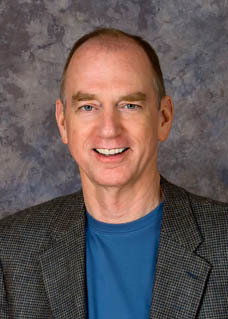 Nonetheless, Professor Laurence Kotlikoff at www.ESPlanner.com says his experience is that paying off the mortgage nearly always increases retirement spending. It is also worthwhile considering lowering your pre-retirement standard of living, the left half of the red line, so you don't have to move the right half of the line so far. By that I mean buy a reasonably affordable home. Maybe trade cars less often. A lofty standard of living while you're working sets a high hurdle for retirement. Living a little below your means before you retire is probably a great idea. What is the bigger picture? I'll cover that in my next post.